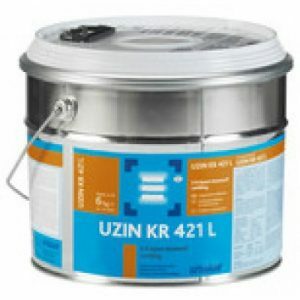 Ardex A46 is a repair compound and is one of the sub-floor preparation products. Ardex A46 self levelling screed is suitable for use over most substrates and adhesive residues. ARDEX A46 is a rapid setting and hardening, slump free mortar which is ideal for external or internal repairs. The mortar sets and hardens rapidly to give a repair of exceptional strength and hardness. The mixed mortar sets after 20 minutes and can be trafficked after only 2-3 hours at 20°C. ARDEX A46 is ready to receive floorcoverings that are not sensitive to moisture, such as ceramic tiles after 24 hours at 20°C. USE ARDEX A46 is ideal for:- • Repairing and refacing external concrete stairtreads and risers, brickwork (not lightweight concrete), renders and concrete floors. • Filling and patching cracks in walls and floors. • Making good around pipework, door and window frames. • Forming ramps from 2mm to 30mm in thickness. • Making patch repairs prior to the application of a damp proof membrane • Forming coves. ARDEX A46 may be used as a wearing surface in lightly trafficked areas. For heavy duty areas, consult the ARDEX Industrial Flooring Range brochure for guidance on the appropriate ARDEX product to use. PREPARATION ARDEX A46 can be applied to dry or moist substrates providing they are hard and the surface is sound and free of dust, grease, oil and other barriers to adhesion. 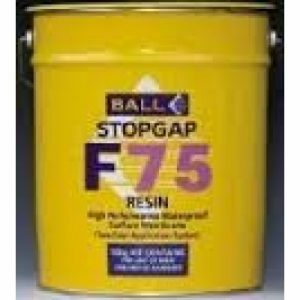 Worn or trafficked surfaces should be mechanically prepared to remove contamination and expose a clean surface to ensure good adhesion. Very dense, smooth, impervious surfaces should be primed with sand blinded ARDEX R3E Solvent Free Epoxy Primer. Priming is not usually necessary on concrete, cement/sand, brickwork etc., unless the surface is extremely porous. On absorbent substrates, the mortar must be initially applied firmly in a thin layer, after that, apply the mortar to the required thickness. MIXING ARDEX A46 powder is added to the required amount of clean water in a clean mixing container and mixed thoroughly to obtain a lump free and slump resistant mortar. The mix proportions are:- 25kg ARDEX A46 powder to 6-7 litres of water, 11kg ARDEX A46powder to 2.7-3 litres of water. Avoid using too much water. The mixed mortar has a working time of 15 to 20 minutes at 20°C, this time being extended at lower, and reduced at higher temperatures. ARDEX A46 can be applied from 2mm to a maximum of 30mm in thickness. 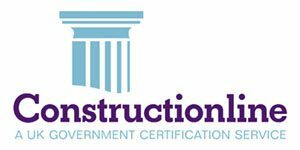 APPLICATION Repairs Apply the mortar with a trowel to holes, cracks and damaged areas, ensuring that the mortar “wets” the surface by trowelling in firmly, leaving the repair proud. After about 10 minutes trim off excess and finish off with a wet trowel, sponge or sponge float to obtain a smooth surface. This smoothing operation needs to be completed within 15 minutes of application. As soon as the ARDEX A46 repair has hardened, the surface of the floor, stairtread etc., can be levelled, if necessary, with the appropriate ARDEX sub-floor smoothing compound. Smoothing and Refacing Apply the mixed mortar with a trowel to the required thickness taking into account the short working time. The material may be finished with a wet trowel after 10 to 15 minutes to provide a finish suitable for direct application of tiles or stone. Apply at temperatures above 5°C. The finished surface has to be protected against direct sunlight and draughts which could lead to rapid drying of the surface. COVERAGE Approximately 1.4kg ARDEX A46 powder/m2/mm. An 11kg bag of ARDEX A46 will produce approximately 8 litres (1/4 cu ft) of mortar. A 25kg bag will produce approximately 18 litres of mortar. A litre of mortar will cover 0.5m2 at a thickness of 2mm. PACKAGING ARDEX A46 is packed in paper sacks incorporating a polyethylene liner – net weight 25kg or 11kg. STORAGE AND SHELF LIFE ARDEX A46 contains a reducing agent to control the level of Chromium VI when mixed prior to use. ARDEX A46 must be stored in unopened packaging, clear of the ground in cool dry conditions and protected from excessive draught. If stored correctly, as detailed above, and used within 12 months of the date shown on the packaging, the activity of the reducing agent (added to control the level of soluble Chromium VI) will be maintained and this product will contain, when mixed with water, no more than 0.0002% (2ppm) soluble Chromium VI of the total dry weight of the cement content of this product. ARDEX A46 must not be used after the end of the declared storage period. 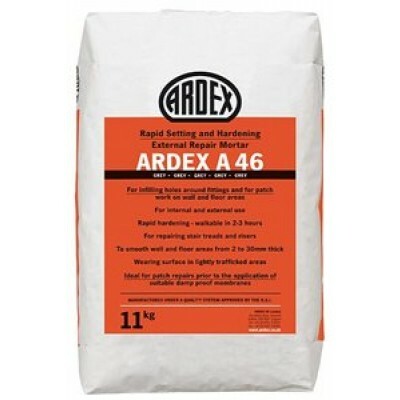 PRECAUTIONS ARDEX A46 is considered non-hazardous in normal usage. The presence of cement in the product gives an alkaline mortar which may cause some local irritation if prolonged contact with the skin takes place. Care should be taken to avoid inhalation or ingestion of dust and prevent contact with the eyes.